Cal Anderson Park is getting $12.1 million in improvements, including a lid over its reservoir that will create 4 acres of additional open space. A series of posts holds up the roofs of the new underground vaults that will replace the Lincoln Reservoir at Seattle's Cal Anderson Park. Ten years ago, Kay Rood noticed the Lincoln Reservoir Park across the street from her Capitol Hill home was about as inviting as a jail cell. Here was a reservoir surrounded by 7 acres of open space, but the place was "neglected and unsightly and unused," says Rood. "It just seemed wrong." So she helped form a grassroots organization, Groundswell Off Broadway, to get the city to improve the park. "We started the ball rolling by saying, 'We really need a park in this neighborhood, and this ain't it.'" The group secured funding to replace a rusting fence and install new benches. It was merely the beginning. Today, the park is an official city landmark and the scene of nearly $12.1 million worth of work. It is the biggest change to the park since the famed Olmsted Brothers landscape architecture firm designed it about 100 years ago. It has a new name: Cal Anderson Park. Two giant vaults are being built in the 21 million-gallon reservoir, which will be covered to provide 4 more acres of open space. Workers are revamping the park, whose crowning glory will be a 400-foot-long water feature that is destined to become a Seattle landmark. "I never would have guessed so much change could come here," says Rood, chairwoman of Groundswell Off Broadway. Lincoln Reservoir at Cal Anderson Park, located at 11th Avenue and East Pine Street, is the first of the in-city reservoirs to be buried. Mayor Greg Nickels wants to bury six other reservoirs. He says his $235 million plan would create 76 acres of open space while protecting the safety of Seattle's water. Starting this year, city officials will work on the design for burying the Beacon, Myrtle, Maple Leaf and West Seattle reservoirs, though completion of the projects hinges on City Council approval, according to Seattle Public Utilities spokeswoman Susan Stolzfus. The burying of the Beacon Reservoir will be similar to the project at Cal Anderson Park because both projects entail improving parks. At Jefferson Park on Beacon Hill, the city has set aside $6 million to upgrade 40 acres of green space. "That's a huge project," says Don Bullard, a Parks and Recreation project manager. His department expects to select consultants this year, though the timing of the entire project isn't clear because it depends on when Seattle Public Utilities moves forward on the reservoir work. Taken as a whole, the project at Cal Anderson Park is complicated. But break the work down, and each portion is routine. "Even though it's a fairly basic project, there are a lot of pieces to it," says Steve Wagner, president and chief executive officer of Tetra Tech/KCM, a Seattle engineering firm that led the design of the new underground reservoir. Workers built a bypass system to take the reservoir out of service. This cost about $2 million and was done about a year ago, according to Wagner, who called it a straight-forward plumbing job. In April, the $12.1 million reservoir burial and park improvements started. It is scheduled to wrap up this fall, and the park will reopen in the spring of 2005 when the turf is established. At the bottom of the reservoir, crews from Mid-Mountain Contractors built a new drainage system to deal with minor leaks. Now they're pouring 9,500 cubic yards of concrete to build two 6.25 million-gallon vaults in the existing reservoir. Each is 210 feet long, 240 feet wide and 20 feet deep. All walls were cast in place. A series of concrete columns, also cast in place, support the roofs of the vaults. "What it looks like is just a great big warehouse inside," Wagner says. Among the challenges for workers was the heat this summer, one of the hottest in recent memory. "It's was like being in a frying pan," says Wagner, who adds it was 10 to 20 degrees warmer on the floor of the vaults than up on the street. Then there is the presence of homeless people in the neighborhood, which is Seattle's most densely populated. "In general, it's kind of a strange environment up there," Wagner says. "We've had some vandalism -- very minor vandalism. Almost every week we have some incident of someone coming on to the site they've had to run off." Another complication arose Sept. 11, 2001. Tetra Tech/KCM was about 85 percent done with the design when terrorists struck the United States. Wagner and his team redesigned the hatches to the reservoir so the vaults will be more difficult to enter. To get to the two locked doors leading to the vaults, a terrorist would have to go through a heavy concrete cap. "If you don't have a crane, you're not going to get into this reservoir under any circumstance," Wagner says. 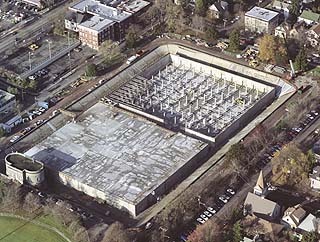 This was one of the few changes, and the project is ahead of schedule and on budget, according to Brent Middleswart, a Seattle Public Utilities project manager. In addition to burying the reservoir, the city is replacing the chlorination system. Previously, workers used a gaseous form of chlorine, according to Middleswart. He says the concern was the chlorine cylinders could leak. Consultants designed a new hypochloride system. Utility employees no longer will handle gas; instead, they will use salt to make a brine. The brine will be processed into a solution similar to diluted household bleach, which will be added to keep the water in the vaults clean. "It's more economical and safe, (and) more environmentally friendly," Wagner says. 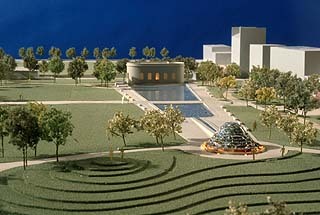 A water feature will be built atop the new vaults, but the systems will not be directly connected. In a few months, the reservoir will be gone from sight, covered by 4 acres of land, which provided a blank canvas for The Berger Partnership, a Seattle landscape architecture firm the city hired to recast the historic park. Jonathan Morley, a Berger associate, says his colleague, Jeff Girvin, the principal in charge, calls the new park "an adaptive reuse." The most noteworthy amenity will be the water feature, which The Berger Partnership designed with artist Doug Hollis and Tetra Tech/KCM. "What we tried to do with this is explore the properties of water in many different ways," Morley says. The feature will have four sections. Water will emerge from the top of a 12-foot, stone-covered cone and run down the sides into the second stage, a trough. From there, water will spill into a pool where it will gurgle over a textured surface and under a walkway into the final section: a reflecting basin that will be next to the historic waterworks gatehouse. The park sprung up around the reservoir, so water always has been an integral part of the environment. The city began building the reservoirs after the Great Seattle Fire of 1889, and Lincoln was created in 1901. Arguing the park without a water reference would be unimaginable, neighbors fought to have the water feature. Water, says Rood, "is a soothing presence to have, especially in a neighborhood like this." Designers had to come up with a way to emphasize to park users the feature is for looking, not wading. Liability was a major concern, according to Morley. Ringing the feature will be what he calls "a coping." It's a 2-foot-wide form that arches in such a way people will be implicitly invited to sit on it while facing away from the water. For the rest, The Berger Partnership designed a new network of paths. Once blocked by the open reservoir, park users will be able to traverse the green space unimpeded. "Generally, it's unprogrammed open space," Morley says. "You can lie on the lawn or play Frisbee." Structured activities will take place on the Bobby Morris Playfield at the south end of the park. The unprogrammed space to the north will be graded so it slopes south into what Morley calls the Grand Lawn. The grading will be done so most of the trees and the community gardens are saved. Among the other new features are globe-shaped lighting fixtures similar to lighting found in other Olmsted parks in Seattle. Morley says the opportunity to recast a park designed by the Olmsteds has been fantastic. "From the outset, the goal was to design the park for the 21st century while respecting the form of the original park design."